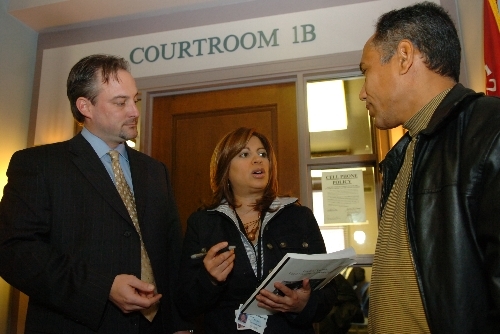 To Schedule a Court Certified Interpreter, please call (213) 385 – 7781, or e-mail info@latranslation.com. Rates vary by language, availability, and location. Please book in advance to reserve the best suited interpreter. In order to promote the spirit of the Constitution, many states conduct tests to certify interpreters qualified to work in courts. LA translation provides court certified interpreters anywhere in the United States, whether in Los Angeles, San Diego, San Francisco, Texas, Denver, Arizona, Seattle, Eugene, Chicago, Atlanta, New York, Boston, or Washington D.C.
Our court certified interpreters are available for attorney-client meetings, depositions, trials, arbitration, mediation, and legal translation for both criminal and civil cases. They can travel to any part of the United States or the world and are available in a myriad languages for your service needs. Call 213-368-0700 to reserve an interpreter, or send an email to: info@latranslation.com. Australian, English, Bengali/Bangla, Burmese, Chinese Simplified, Cambodian, Chinese Traditional, Fijian, Hmong/Mien, Indonesian-Bahasa, Japanese, Khmer, Korean, North Korean, Laotian, Malay, Marshallese, Tagalog, Thai, Tibetan, Vietnamese. Assamese, Bengali, Bhojpuri, Dari, Dogri, Gujarati, Hindi, Kannada, Malayalam, Manipuri, Marathi, Mizo, Nepalese, Oriya, Punjabi, Pushto, Sanskrit, Sindhi, Singhalese, Tamil, Telugu, Urdu. American English, Brazilian Portuguese, Eskimo, Guarani, Haitian-Creole, Nahuati, Spanish (Latin), French Canadian. Afrikaans, Amharic, Bushman, Damara, Dinka, Hausa, Igbo, Kikuyu, Malagasy, Masai, Ndebele, Oromo, Pedi, Shangane, Shona, Siswati/Swazi, Somali, Sotho/Sepedi, Swahili, Tshivenda, Tswana, Twi, Venda, Xhosa, Xitsonga, Yoruba, Zulu. Los Angeles, Texas, Denver, Phoenix, Seattle, Eugene, San Francisco, Chicago, Atlanta, New York, Boston, and Washington D.C., Beijing, Seoul, Tokyo, Paris, Berlin, Madrid, Mexico City, Moscow, Hanoi, and Dubai, and everywhere in the world.